IBS affects about 15% of the UK population. That amounts to 85,000 people in a city the size of Sheffield. People with IBS suffer with bowel irregularity often with symptoms of urgency and incontinence. Some won’t even go out for fear of ‘accidents’ and those that do, need to know where all the public toilets are in case they need to go in a hurry. But it’s not only those with IBS and other bowel conditions that need convenient access to toilets. Consider also those with bladder problems, people on diuretics, diabetics, pregnant women. And what about the elderly trapped in their homes and at risk of loneliness and depression, or children, who may develop all sorts of unhealthy bowel and bladder habits through holding on too long. Access to well maintained, clean public toilets is not only a human right in any decent community, it is a lifeline for a significant proportion of the citizens of Sheffield. It is therefore with anger and dismay that we have learnt that 5 more public toilets are to be closed in the city. The council says there is a lack of demand. I don’t believe it. There must be well in excess of 100,000 people across the city needing urgent access to toilets. Perhaps if they were better maintained….. They also state that provision of public toilets is not cost effective in times of austerity and consequently have not renewed the maintenance contract. The two automated toilets remaining in the city centre may be cost effective but they are not popular with shoppers, as they are not always clean and often malfunction, with the door springing opening to allow others to witness what should be a very private performance. Many people will no longer shop in the city centre because of the lack of facilities. The IBS Network (www.theibsnetwork.org) is trying to help by issuing their own ‘can’t wait cards’ so that people can at least use them to gain access to toilets in offices and stores, but not all managers honour these. Some councils are exploring the idea of a Community Toilet Scheme involving pubs and restaurants. But in the meantime, what are people going to do? There is already a health problem with the soiling of secluded doorways, garages, bushes and lay-bys. Are we to do what dog owners do and carry plastic bags full of human faeces to hang up like Christmas decorations on trees in public parks? Is the much vaunted need for austerity propelling us back into forgotten age, where there was raw sewage in the streets and infectious disease commonplace? The Victorians understood the need for public convenience and built palatial loos, nearly all closed now, although some have been turned into restaurants or meeting places (perhaps they always were!). Have the city fathers (and mothers) of our once great cities forgotten the need for common decency in their haste to make cuts? If so, it is a false economy as it pushes the problem on to the NHS who have to deal with the medical ‘fallout’ and provide continence products. The consultation runs until October 18th. 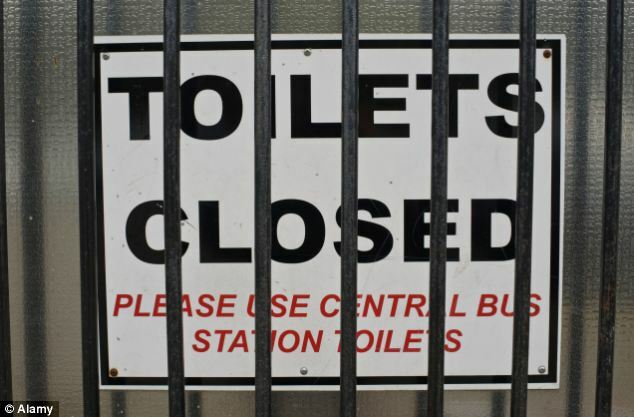 This entry was posted on October 1, 2015 by nickwread in Toilet Closures and tagged Campaign, Irritable Bowel Syndrome, Toilets.